Stripbind – The Report Binding System For Every Office. The Report Binding System For Every Office. A unique Binding System that allows you to bind documents in Seconds, On Time, Every Time. The Meter Stripbind Document Binding System allows the user to create professional Reports and Booklets in Seconds. The Stripbind’s unique split punching system makes Binding a breeze. Its ease of use and size ensures that every office can use the Stripbinder. An ideal Binding System for use in Schools, Accountants, Government Departments and all companies-even large corporates for confidential documents where a fast and inexpensive Bind is required. Compact, Secure, Mail Friendly. The Stripbind Binding Machines are available in 2 Models. The STBA4 Binding Machine is suitable for A4 documents. The STBA2 Binding Machine is for A3 and A2 size documents. Ideal for plans and drawings used by Architects, Town Planners, Builders and Construction Companies. 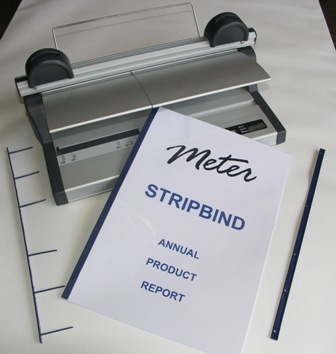 The Meter Stripbind System offers the user several distinct advantages over other forms of binding. This type of Binding is very Mail Friendly. Unlike Comb and wire binding, which can be crushed when mailed, the Stripbinder ensures documents arrive in the same condition as when posted with easy insertion into envelopes. It is also an extremely robust type of binding due to the closing pressure of the strips. The Stripbinder Binding Machines are extremely portable and also compact, being small enough to fit into a medium size desk draw, despite being able to punch up to 20 sheets of paper at once. The Stripbind Binding System is Economical, with low cost consumables. Unlike Comb & Wire Binding, one size strip fits all document sizes – so you can bind 10 pages or 110 page documents with the same size strip, reducing the need for multiple stock sizes . Click on the links below for more information and pricing on Stripbind Products and Binding Supplies.